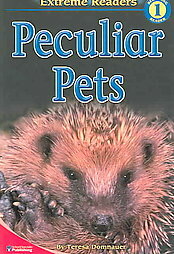 The Peculiar Pets Extreme Reader investigates unusual animals that are kept as pets around the world. This unique level 1 nonfiction reader for preschool to kindergarten learners will help them explore reading on their own. Dramatic photographs, graphic illustrations, and an amazing “Extreme Facts” list will keep them turning the page. The fact-based approach also makes this book a valuable resource. Children will love to learn to read when given this Extreme Reader!